Most musical instruments are not primarily associated with one particular style of music, especially in these days of cross-cultural collaborative adventures. The exception is the harmonica. Sure, notable harmonica artists can be found in country, folk, jazz, Irish, bluegrass and even hip-hop, but outside of blues, the harp (from the moniker “mouth harp”) just really isn’t the musician’s instrument of choice. Rock has a goodly number of harp players, but mostly they’re just playing solos and accents. For full-time, full-on harmonica, blues is where it’s at, hands down. Indeed, the explosion of the blues in the 1950s was fueled by the talents of such great harp players as Sonny Boy Williamson II, Little Walter Jacobs and Big Walter Horton, and Muddy Waters always insisted on having a harmonica player in his bands. The blues flame got a renewed flare in the late ’60s through James Cotton, the late Paul Butterfield and John Mayall, and today continues to burn brightly with such masters as Charlie Musselwhite, Kim Wilson, Mark Hummel and, until his death in 2009, Norton Buffalo. Still, the mainstream limelight just never quite shines on harmonica players. Standing tall both literally and figuratively, Brad Wheeler fights that obscurity. A popular DJ on KRCL Radio (90.9 FM), he is also half of local band The Legendary Porch Pounders. 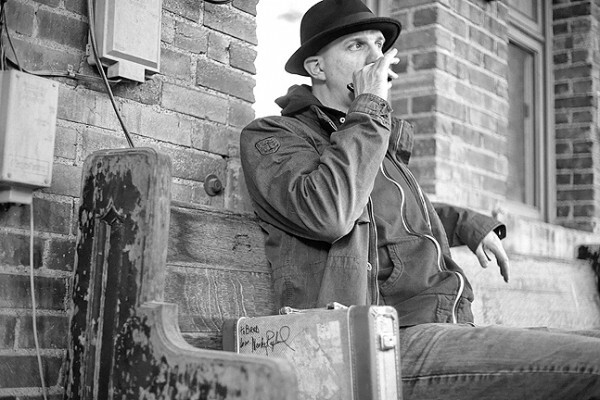 Wheeler’s harp stylings helped propel the group to a win in the 2005 City Weekly Showdown to SXSW competition, and since then have also kept him busy on the side with a variety of guest slots for bands around town. “Bad Brad” taught in an educational program for elementary students in the Davis and Weber County school districts called Blues in the Schools, in which he estimates over 50,000 kids were introduced to the harmonica. While not abundant, there are several good local harp players to be found, including Robby Kap with the Kap Brothers Band, Nick Greco and Blues on First, Chris Condie, and Snakey Jake playing with Zach Parrish. For me, each time I replay “The Santa Train,” a short harmonica riff Buffalo played so wonderfully on my telephone message recorder one Christmas morning, it forever keeps the harp—and him—front and center.